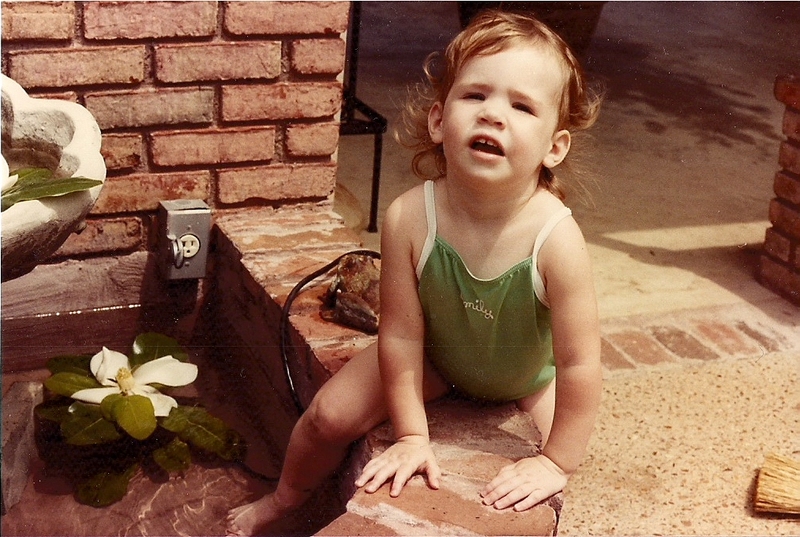 On January 16, 1982, a Mimi was born. A fancy grandmother. Was Mimi ever not a fancy grandmother? How did she exist before her first grandchild came into the world? Who did she make chocolate pudding with the skin on top for before that day? Who did she talk about at Garden Club and Birthday Club meetings? Who did she smell good for? She had a life before she was a Mimi. By the time you met her, she had already had her heart broken and shredded. You would later on learn about her little girl who died before her seventh birthday. You’d see Marla’s grave marker with a pleasant patena all over it next to her father’s – the grandfather you never met. A young widow. You would rarely hear Mimi talk about them. Her own childhood was far enough away for her to be a bit more candid. You wish you had listened closer. You listened when she talked about working at Oak Ridge but you didn’t really get the full weight of her job there. But in 1982, those things were in the past and Mimi was not yet aware of all the heartache that was still to come. But that was OK. She had been too busy preparing her dusty peach castle for your arrival. It was your playground. You didn’t have to be told not to touch the artifacts surrounding you in her house; it was obvious that they were just to be observed and admired. She had married again – a grocery store proprietor – who built her a home at your disposal. You played in the Venus di Milo fountain in her backyard and pulled the paper off her birch tree, even when she told you doing so would kill it. Mimi’s trees were for pulling apart. You slept in the pink guest room which Mimi called The Princess Room, and the nearly inaudible click of the light on the security box in the room lulled you to sleep. She had a cleaning lady named Cather who prepared her home for your family’s late afternoon summer barbeques. Cather came to Mimi’s funeral and your dad treated her like family, and it wasn’t just because they had both cried that day. Cather would clean while Mimi prepared the food. A platter full of tomatoes, lettuce leaves, and big thick circles of raw, sweet Vidalia onions all piled up on a plate to garnish the burgers. On an outside buffet table – an outside buffet table! – the garnishes went where Mimi deposited them under a tiny mesh umbrella to keep the flies away. You made a note to use the food umbrellas later for a tent for Barbie. As the adults skittered around and made the food, you made yourself a beverage. There were several choices at Mimi’s house: Diet Pepsi, Diet Pepsi, and Diet Pepsi. There was also La Croix seltzer water but you learned the first time you tried those things that the bottle was just kidding when it said it was flavored like strawberries. So, Diet Pepsi it was. You took the glass bottle from the kitchen pantry to prepare the drinks in Mimi’s living room bar. The bar, which was set in an alcove and could be closed up with sliding doors, had recessed lighting and glass shelves. It housed an icemaker and Mimi’s collection of swizzle sticks from around the globe. The more swizzle sticks you put in your drink, the better it tasted. That’s just commonsense. The ones with little Peabody ducks at the end were the most medicinal, so after you made yourself a Diet Pepsi, you returned to the bar with Mimi’s Teddy Ruxpin, which she had acquired for your enjoyment at a silent auction at a Summit Club fundraiser. There was always something wrong with that Teddy Ruxpin. His tape never synched up with his mouth, which required him to go to the doctor, have his tan outer vest removed and swizzle sticks inserted in all his orifices. Just as the operation was about to take place, the meal was ready: hamburgers and slaw and potato salad that you likely wouldn’t eat. Mimi only put yellow mustard, onions, and lettuce on her sandwich, an oddity you wrote off as a function of her relative oldness. She was too fancy for ketchup with that word on its bottle. You mulled over your plan to stay the night. Staying the night at Mimi’s was the best because she let you do what she did. There were no pre-planned child activities for your visits. If you were flying solo then she’d take you down the street to Wendy’s and get a taco salad for dinner. Later, you both got into your jammies, popped a bag of popcorn, and watched The Golden Girls. Mimi would smoke a cigarette or two while you both giggled at the whimsy of Betty White. No matter that you had no idea what was going on. The Golden Girls were the Mimi equivalent of watching Grease at your house: likely too inappropriate for a seven-year-old but oh what the heck. When the popcorn was dwindling and the night’s episode of Evening Shade wasn’t featuring the funny southern nurse, you retired to your princess room and asked Mimi to read Eloise to you. 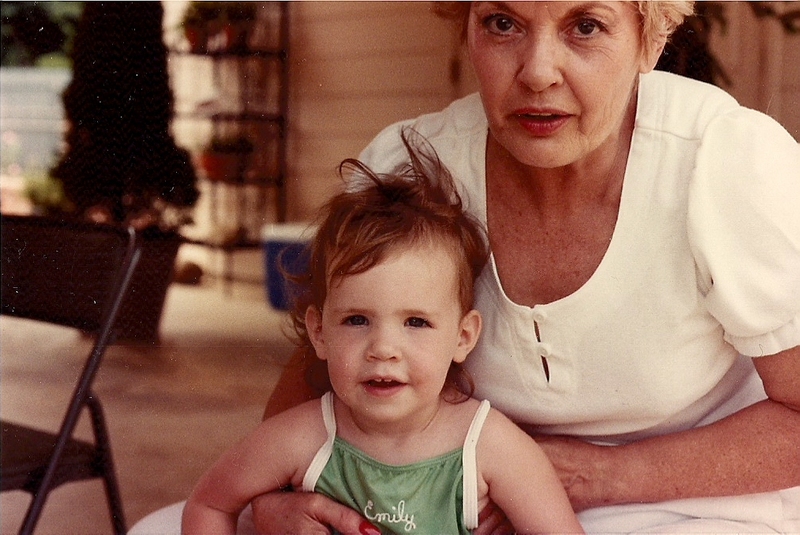 Eloise was Mimi’s favorite book that she read to you at night that wasn’t Danielle Steel. Not that she read Danielle Steel to you; she had boundaries. Curled up next to you, Mimi would show you New York through the eyes of a precocious six-year-old. Mimi did not manufacture a child sing-song voice as she read. As far as you knew, Eloise spoke with the same tone as a 62-year-old woman, and although the book does not feature a great deal of punctuation, Mimi’s rhythm always slipped a period in. She knew the exact right moments to pause for effect and which exact part you should skip. Hint: it’s the part that involves singing. Mimi didn’t sing much if she knew she would be heard. Church didn’t count because her voice was incorporated among all the other voices. She still went to the early service just to be sure she wouldn’t suffer overexposure. Out went the light and off Mimi went down the long hall to her room, leaving a lovely smell of cold cream and perfume in her wake. You buried your head in the down pillows and felt like Annie during her first moments at Oliver Warbuck’s home. Mimi really was yours and you wouldn’t have to go through the formality of a feature-length film to know that the safety and security you felt in your fancy Mimi could only be hinted at with the click click of the room monitor. Two words… Freshly Pressed. Brilliant, Emily!! The photos are amazing and of course adorbs. I think Mimi and I would have gotten along swimmingly because the drink selection at my house includes, Diet Pepsi, Diet Pepsi and Diet Pepsi, too! Loved this!! Beautiful, Emily. Mimi sounds wonderful. Thanks, Cathy! She really was. Some people just seem meant to be grandparents. Indeed they do. She was for sure meant to be one. This was amazing, Emily! I loved all the little details, and I’m so jealous of your memory. I’ve been trying to remember more things in my childhood so I can write about them and so much of it just seems like a blur. Mimi sounds wonderful. You were lucky to have her. Just start writing and I bet you’ll find that a lot of them are just hiding. I uncovered a lot of long-forgotten things in the recesses of my mind when I wrote this. Thanks, Ash! This was so sweet. It made me thinks about my own grandmother, something I probably don’t do enough since she passed away when I was young. Beautiful post. Thanks, Katie! I love thinking about my grandmother because she’s been gone for a really long time too. Thinking about her gets me in my happy place. This was too well-written for a blog post. Did you actually take consideration for the reader? Don’t worry; I have another search engine term post in the hopper. I love that you have such clear memories of your time with her. I have many similar memories about both of my grandmothers that I will always cherish. Mimi was so pretty and I love the picture of the two of you. Thanks, Em! She was definitely a beauty. One time when my family was living in Mississippi, she came to visit us one weekend and when she came to church with us, my parents’ friends kept saying that she was “one fancy lady”! Haha love it. Wonderful! Thank you for introducing us to Mimi. The bottom part of his mouth got ripped off eventually. He’s living out his twilight years in my mom’s attic. I want a Mimi! Such sweet memories. I grew up with Diet Pepsi poured into my bottle, so I guess I kind of grew up with the stuff too. Nectar of the gods. I love that picture of you in the fountain and the one at the end! So cute. I love the little moments of life that you were able to share with us. You’re such a good writer Em. I would read your book for reals. Awww thanks, Lils! I am kind of amazed at how much I managed to remember. It must have been the Diet Pepsi that locked in the memories. Are you too young to remember the Ray Charles Diet Pepsi commercials? Pretty awesome. Breathtaking. I lived in every memory you recited. Well done, Emily. You’re getting pretty damn good at this whole writing thing. You made me tear up. In another word: beautiful. I got a little misty writing it too. These memories are so special to me. ^ What Ruby Tuesday said. This is just incredible! Put this one on your book for sure! The details are just stunning, the perspective of a child just perfect. Also, mad props for your swimwear. Very chic. I know, right?! I LOVE that bathing suit! I obviously don’t remember having it but I think I need to get a grownup version. Thanks! Love you. Amazing. Those details and the perspective of a 7 year old are so fitting. Everyone loves a Mimi. Mimis are the best variety of grandmothers. There is just something about them. This was utterly magnificent, Emily. Thanks, Hookster! It is a really special post for me so I’m glad you liked it. I agree! A very special secret world exists between grandmothers and their granddaughters. I wonder if your Mimi knew my Mimi. She worked in OR during the war, too. And after. They really could have known each other! It’s a small world. Grandmas are the best. Did you get any Werthers originals? Ha! My other grandmother was more of a candy hoarder. Mimi mostly just had a ton of boxes of Melba Toast. I don’t even know. Actually, it was the playing in the fountain. What a touching tribute to an obviously wonderful grandmother. As always, well written and articulated. Thanks, TD! This one means a lot to me so I really appreciate your words! Can’t remember if I commented or not. So I will comment now again or for the first time. This is a truly beautiful piece of writing. And if you write a book it should be like this post, because this is moving writing. Such a lovely character study about someone that was so dear to you, Emily. You have encapsulated the entire reason why, the only time I ever officially ran away, I ran directly to my grandma’s house, do not pass go. I especially enjoyed all the sensory references, which reminded me of my own dear grandma. Do they even still make Jean Nate?! This took my breath away. I could see your childhood, all the while seeing memories of my own at my Mema’s house come flooding back. In honor of Mimi on her 87th birthday. Miss her and love her. what a great memorial to your grandmother – she sounds like she was perfect! Love it! What a cute baby you were. I spent a lot of time with my grandma, who, at 84 years young now, is still going strong. I need to be a better grandson and go see her more often! Great post, Emily. Oh Emily. It’s funny, because I don’t remember having read this before, but I cried again. This piece truly is magical, the kind of thing I only wish I could write. And for whatever reason, it’s also made me very sad in a certain way that I didn’t do the get married and have kids thing, not for me but for my parents. They’re very happy with the family I have cobbled together for them out of the next generation, but I know they would love so much to have my girls be theirs and visit without me here. I guess even when they do the Halloween decorations with my dad or open presents on Christmas Eve with my mom, still I’m always there in the middle (and so sometimes are their parents). Phooey. I’m all emotional and having a hard time explaining. Also, there’s just a lot more behind this. But this post is the best thing I’ve read in a long time, even if I’ve read it before. It’s the kind of thing I want to crawl into and live in. For whatever sense that makes. As a girl who loved spending Saturday mornings with my Mamaw watching Shirley Temple movies and eating Green Goddess and iceberg lettuces sandwiches on Roman Meal bread, I salute your Mimi memories. Such a beautiful tribute to your grandma. I lost one grandma two years ago (nearly to the day), and my other grandma in October of 2012. Your repost really resonates with me today. P.S. Teddy Ruxpin, Golden Girls and Evening Shade – love it! Beautiful writing. You made me feel like I knew Mimi. I loved this story! You told it so well that I too can smell the cold cream and perfume. I hope I will be a Mimi someday-she did it up right! Your memories and words went straight to my heart. I was thinking about own Gram a lot this week as it’s her birthday this month. Thanks for such a sweet, vivid post. Really made me smile. Love the swizzle sticks in Teddy Ruxpin. You make me want to watch Golden Girls with Mimi. This is so well written – such detail. I wish I had a Mimi to tuck me in and read me the New York with dramatic flare when I was a child. Reminds me of watching soap operas with my grandmother. Totally not inappropriate. Great post. Here’s to Mimis everywhere. Beautiful! Makes me wish I had known one of my grandmothers and hope that one day I can be the kind of grandmother you had. :) As usual, Emily, thanks for sharing your heart with the rest of us. I’m so glad you reblogged this – as I’d never had the pleasure of reading this post! It brought me to tears thinking about how much I will miss my Memaw once she’s no longer with us. Just the thought of having to rely on memory to relive her voice, her matter of fact story reading and how much she loved us kids and now loves my daughter. Thanks for sharing your this with us – it just reinforces how precious life is and how much fun it is to make sure all of the memories I don’t want to forget are recorded and documented as best as I can! Now time to try to clear this frog from my throat – and if anyone asks I was cutting onions! ← Please don’t get C a blanket she can draw on for her birthday.